November 6 marks the start of the world's toughest single-handed race in Les Sables d'Olonne on the French Atlantic coast: the Vendée Globe. Mercedes‑B enz is represented for the first time with three racing yachts. In the capacity of co-sponsor and technology partner, the company is supporting the British extreme sailor Alex Thomson, who finished third in this non-stop round-the-world regatta in 2013. This year, the Mercedes‑Benz brand ambassador is competing in the new IMOCA 60 racing yacht. It features carbon-fibre technology from Formula One as well as an all-new infrared-reflective paint finish. Mercedes‑Benz is once again co-sponsor of the French racing yachtsman Vincent Riou, who won the Vendée Globe in 2004, and of the Irish circumnavigator Enda O'Coineen, who is making his debut in this solo race. The competitors have to sail on average 29,000 miles non-stop and single-handed – from France past the Cape of Good Hope in Africa, Cape Leeuwin in Australia and Cape Horn in South America back to Les Sables d'Olonne in France. Alongside HUGO BOSS, Mercedes-Benz has been a co-sponsor of Alex Thomson Racing since 2015 and supports the sailing team with technological know-how. The current racing yacht is made of carbon fibre, which is also used in Formula One. This makes the boat five percent lighter. The hull and deck are coated in a new, black "XCool" paint finish that was developed by BASF in collaboration with Mercedes-Benz. It reflects infrared radiation and prevents overheating inside the yacht. In addition, the fibre composites of the hull are exposed to markedly lower temperatures. 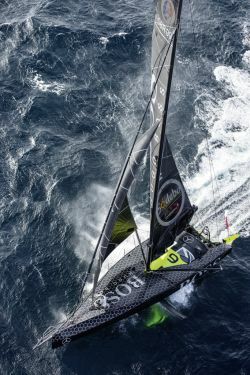 Alex Thomson plans to make history with his new yacht and wants to become the first Briton to win the Vendée Globe. "The team has worked incredibly hard to develop and build the HUGO BOSS," says Alex Thomson. "I'm confident we now have a boat with which we can win this race. This racing yacht is the fastest and lightest we've ever had." Vincent Riou is competing in the Vendée Globe for the fourth time. On his debut in 2004, he won in 87 days, 10 hours, 47 minutes and 55 seconds to set a new record. Already at that time, Mercedes‑Benz was a co-sponsor alongside the French company PRB. The 61-year-old businessman and circumnavigator Enda O'Coineen is the first Irishman to compete in the Vendée Globe. Together with the MSL group of automotive dealerships, Mercedes‑Benz is sponsoring his "Kilcullen Voyager – Team Ireland" racing team in addition to an education programme for primary schools set up by O'Coineen. The schoolchildren will be able to plot the progress of the race on a map – with live tracking, weekly videos and entertaining lesson plans. The solo yacht race, which takes place every four years, pushes sailors to their limits. Of the total of 138 competitors since 1989, only 71 have completed the full distance. The race is open to monohull yachts conforming to the Open 60 class criteria. The race can be followed live by race tracker at www.mercedes-benz.com/alexthomson as well as on the Vendée Globe social media channels.